Tragic Hollywood – Who killed funnyman Ted Healy? Wallace Beery won the Oscar in 1931-2 for The Champ, even though he actually scored one less vote than Fredric March that year. The rules of the previous year awarded Oscars to performers who finished within three votes of the winner. Presenter Conrad Nagel, unaware that the regulations had been changed, incorrectly called for another Oscar for Beery without conferring with Academy officials first. Nobody was game to suggest to the irascible Beery that he should return the statuette, so both actors are still credited with Academy Awards to this day. Little Jackie Cooper, who played the boy in this classic tearjerker, later abjectly dismissed any thoughts movie-goers had of a special bond existing between Beery and himself. Good old Wally, he said, was a violent, foul-mouthed drunkard. Few who knew Beery disagreed. Jackie could not stand working with the man whom he described as one of the most sadistic and cruellest people he had ever known. MGM trouble-shooter Howard Strickling went to considerable lengths to create a ‘big, loveable slob’ image for Beery whose former wife, Gloria Swanson, commented drily that he had been invited into every fashionable home in Beverly Hills – but only once. 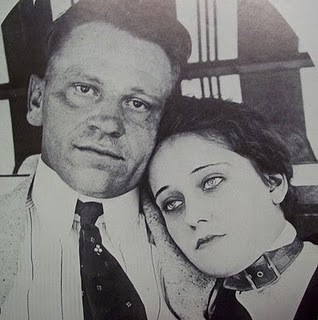 (His abominable treatment of her is covered in Hollywood Warts ‘n’ All Vol.1) At one stage in his career Beery insisted on being paid one dollar a week more than every other MGM star, just so he could claim the title of the highest paid actor in the world. On 21 December 1937, Beery rang his pal and MGM’s fixer Eddie Mannix and told him he had been in a fight outside the Trocadero Restaurant. Also involved were Albert ‘Cubby’ Broccoli and mobster Pat DiCicco, and between the three of them they had badly beaten vaudevillian comedian Ted Healy, the man history generally credits with ‘inventing’ the Three Stooges. DiCicco positively hated Healy because the comedian had dated his ex-wife Thelma Todd. Healy hated DiCicco because he used to beat Thelma and may even have been involved in her death. Beery and Healy had no time for each other either. Both men were real jerks and disliked by almost everyone they came in contact with. One story states that a fight broke out at the Trocadero bar that night when Beery punched Healy in the face, probably because Healy had hit Broccoli a couple of times prior to that, either that same evening or the night before. Displaying more courage than sense the intoxicated comedian offered all three men ‘outside’. He would beat them all one at a time, he bragged. Broccoli sneaked outside ahead of the others, then jumped on Healy when he emerged, holding him down while Beery and DiCicco beat him mercilessly. They left the unconscious comic in a pool of blood and returned to the bar to celebrate. Friends found the stricken man and took him home in a taxi, but he died of head injuries the next morning. 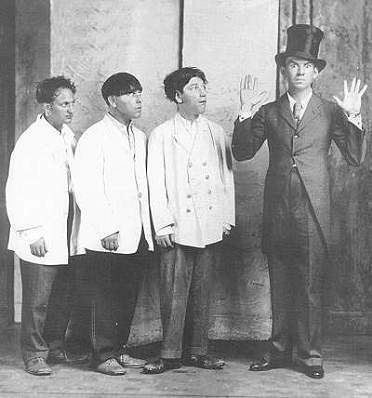 Before he died, Healy called Shemp of the Three Stooges (and others) and described what had happened to him. The police called MGM Publicity Department head Howard Strickling, but never explained why they did so. On December 23 the Los Angeles Daily News reported that Ted Healy had fought with wealthy New Yorker Albert Broccoli. Extraordinary as it may seem, the man was never questioned by police and the case was quickly closed. Dr A.F. Wagner, the autopsy surgeon, declared that Healy had died ‘from nephritis and alcoholism’. The severe head injuries, observed by Healy’s widow and photographed by the Daily Mirror, evidently went un-noticed by him in his report! Surviving photos of the body clearly show at least six serious head injuries. Healy’s own doctor refused to sign any of the autopsy documents unless there was a police investigation into the death, but the corpse was embalmed at once, making any further investigation into evidence of alcoholism pointless. Stories have since circulated that MGM immediately sent Beery and his family on a vacation to Europe, but that cannot be correct because he was actually shooting a movie at the time. There was certainly no mention made of his name in connection with DiCicco or Broccoli, however, probably because they had Mob connections. Trocadero staff were already on MGM’s payroll, being paid to inform on any partying stars, reporting directly to Mannix or Strickling. None could recall any real altercation, although they could vaguely recall Healy arguing with ‘three drunken fraternity boys’. Of course, the police were unable to name or locate them. Curly Howard of the Three Stooges noted that Beery’s name was never officially mentioned in connection with Healy’s demise. ‘That can’t be on the level’, he said. Healy’s widow told newsmen that the cops were investigating the wrong people. Her MGM contract was torn up. She suddenly found herself blacklisted at every studio and never worked again. Broccoli’s girlfriend (later his wife) was Gloria Blondell, Joan’s sister. She had no movie experience whatsoever, but was quickly thrown into Accidents Will Happen (1938) opposite Ronald Reagan. DiCicco was a two-bit hood with enough surface charm to land both Thelma Todd (the ‘Ice-cream Blonde) and 17 year-old heiress Gloria Vanderbilt as wives. (Gloria came with a $4.5 million bank account). Neither union was a happy one. DiCicco was known as mobster Lucky Luciano’s right-hand man in Hollywood, but fundamentally he was a bootlegger and a pimp. He was also the cousin of Albert ‘Cubby’ Broccoli. He engaged in frequent, drunken brawls with Thelma during their stormy marriage. There has even been speculation that he may have had something to do with her mysterious death, but there is no real evidence to support this. He also regularly beat Gloria. ‘He would take my head and bang it against the wall’, she said. ‘I had black eyes’. All in all the delectable Pat DiCicco was a bully and a wife-beater. His looks would get him into a couple of movies, but he would later label himself as an agent/producer. Broccoli moved to England in the early fifties and eventually teamed up with Harry Saltzman, a Canadian who owned the rights to the James Bond character and was eager to get into the movie business. The pair formed a company and created Dr No, From Russia With Love, Goldfinger etc. Whilst in Japan, in 1966, scouting locations for another Bond feature You Only Live Twice, Broccoli made a last-minute cancellation of his ticket aboard BOAC Flight 911 in order to watch a ninja demonstration. The aircraft crashed next day killing all aboard. Cubby’s version of events at the Trocadero sounds a little too good to be true. He claimed he offered Healy his congratulations on the recent birth of the comedian’s son, and was promptly punched in the mouth and then on the chin for his trouble. ‘I shoved him away because I didn’t want to hurt him’, recalled the remarkably forgiving Broccoli. Healy was ushered into an ante-room, but later sent attendants to ask Cubby to speak with him. ‘I went in and we shook hands’, said Cubby. ‘He got into a taxi-cab and that’s the last I saw of him.’ Maybe, just maybe, Cubby was the ‘forgiving type’, but his cousin DiCicco most certainly was not. For him to let Healy walk out after having belted his cousin twice, apparently for no reason, would have been completely out of character. Besides, he loathed Healy anyway because of his intimacy with Thelma Todd. Healy was an egotistical, nasty drunk whose vicious temper and confronting nature were forever getting him into fights. Wallace Beery was almost a cardboard cut-out of him, temperament-wise. Few people liked either man much. Exactly what happened outside the Trocadero that night may never be known for certain, but there appears to be enough evidence and recollection to put a pretty strong case for the trio of DiCicco, Broccoli and Beery beating Healy severely enough for him to succumb to his injuries. Did Mannix and Strickling move to cover up Beery’s part in the affair? More than likely, given their track record down the years. After all, their job was to ensure that MGM’s money-makers kept making money for the company. They weren’t interested in the fate of either DiCicco or Broccoli, but helping Beery out meant helping them as well, so they got a break by default so to speak. Gay Hollywood in the studio days. I’ve just read this post, via a Facebook thread about Thelma Todd. Fascinating stuff! Along with everything else, I’m trying to determine if Thelma had an affair with Healy. Any more light to shed on that? (I’m an author of pop culture and entertainment books, currently working on one focusing on comedy in the 1930s). I am sorry, Garry, but I am unable to help you there. She certainly knew him, of course, but I personally doubt if they were intimate. Mind you, that is just my opinion, nothing more. My pleasure, Edie. Glad you enjoyed it. You are quite right, of course. The lady looks nothing like Thelma Todd. I stand corrected. Thank you. I might do some old TV next time.